Did you find the site interesting? Any comments or questions? Being only just over 1200 km from the North Pole (and the world's most northerly dial at present) the Longyearbyen Sundial is unique in many ways. Any sundial above the Arctic Circle has a good reason for a 24-hour hour line to show the sun at midnight for a varying number of days. Because this one is so northerly it can show the midnight sun for quite a long period of time - almost four months (from approximately 26 April to 16 August). The position it has been placed in is very good for catching the rays of the midnight sun - only one week each side of its presence is missed out due to Forkastnigsfjellet in the north. If you compare this dial with other horizontal dials at lower latitudes, you’ll notice a difference in the spacing of the hour markers; the lower the latitude, the closer together the hour markers get around noon and more spacious around 6 am and 6 pm. At this latitude, the suns angle to the dial plate changes relatively little throughout the day (25 degrees as opposed to, for example, almost 180 degrees at the equinox at the Equator) so the shadow moves at a more uniform rate - therefore the hour lines can be more equally spaced. It also means that, to people who come from lower latitudes, the sun appears to move quite quickly around the sky, especially in the middle hours of the day. Please go to http://liftoff.msfc.nasa.gov/Academy/Earth/Sundial/Sundial-how.html for an excellent illustration of this concept. 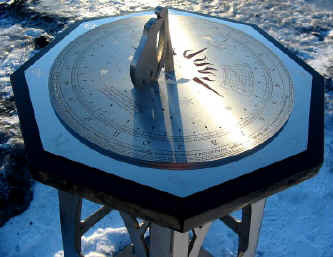 The angle of the gnomon for any horizontal sundial must be the same as the latitude of its location, in the case of Longyearbyen, 78 degrees. This way angle of the gnomon is parrallel to the Earth's axis. So on this dial it is closer to 90 degrees, or steeper, than any existing dial. A gnomon points to the celestial pole of that hemisphere, in this case pretty close to the Pole Star, or Polaris. If you measure the suns azimuth at the same hour of the day throughout the year, you’ll notice that the suns azimuth at that hour changes as the year goes by (except for noon and midnight; at these hours the azimuth is constant). The gnomon must be at an angle equal to the latitude to compensate for this. As you can see, a polar bear decorates the gnomon, and here he is covered in ice. Because the sun never rises above 36 degrees at this latitude, the gnomon only needs to be quite short in order for the shadow to reach the hour line at the summer solstice (when the sun is highest and shadow shortest). See an illustration of this on the Photos page under 'shadows'. Another interesting feature is the 'midnight overlap' developed by Tony Moss, sundial expert from Newcastle, England, who worked with me to create the sundial. On most horizontal dials, you will see a gap at midday (the Noon Gap), to allow for the thickness of the gnomon's shadow when the sun is directly in line with it. 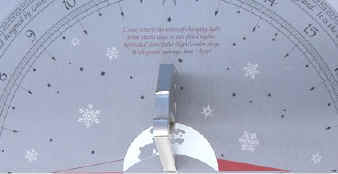 Most sundials do not show the time from perhaps 8 pm to 4 am (as the sun has set), so this problem does not occur on the opposite side of the dial at midnight. However, as this dial is designed to show time 24 hours a day, there is an 'overlap' where the time leading up to midnight is read from the western edge of the gnomon, but at the start of the new day, the time is read from the eastern edge. This graph is on the western side of the dial. During the three-month long 'Polar Night', I thought it might be useful to have some method of telling the time from the moon's shadow on the dial. It gives only a very approximate idea of the time (within around 30 minutes accuracy) but is mainly there to illustrate that there is a relationship between the sun's and moon's paths across the sky. It's not really useful for any practical purpose (for example to get to your appointment on time) - to begin with you need to stand and do quite a lot of calculation which could make you even later (and considerably colder)! It is purely for interest's sake, as, in reality, is the whole sundial in this age of digital watches and mobile phones. Click here for more information on the chart. One particular problem with having a sundial at this location was the freezing and thawing of the upper layers of earth and movement caused by this (a sundial will only work when it is kept in the same position it was installed in!). The permafrost (ground which doesn't thaw) can be 400 m deep in Svalbard. In winter, it reaches ground level; in summer, the earth can thaw down to 1 m, making the ground 'sink' (See 'photos' under miscellaneous). Leif Wiiks, of Vedlikeholdsbutikken, suggested using wooden pylons rammed into the permafrost, the same way the house foundations are constructed up here. There are three pylons which go a whole five metres down into the permafrost. I reckon they're strong enough! Another challenge with putting in a sundial at such is northerly location is the huge length of the shadows due to the low altitude of the sun, especially early in the light period (See Photos page). The sundial has to be placed well away from objects whose shadow may interfere with the reading of the dial. This meant putting it well away from the centre of town, in fact any buildings at all. As Longyearbyen is surrounded by 500 m mountains, it was also difficult to find the best spot out of their influence. Finding a shadow-free area in a place people would visit was quite a task. Out in Adventdalen or on top of Platafjellet would have been most suitable from a sunshine point of view, but not from an observers point of view! The spot chosen is very good for access to morning, evening and midnight sun, (and afternoon sun in the middle three months of the season) and is in an area of public interest (war memorial nearby, National and Workers Day celebrations closeby) and on a main walking route around the town. It is actually quite a simple dial, and the design of the dial intends to highlight this. At the North Pole, a sundial would be extremely simple - a vertical shadow stick (at 90 degrees to the earth's surface) with 24 equally-spaced hour markers surrounding it. A dial up there would, however, need to be moved quite often as the ice floes would carry it away on a regular basis! In fact, telling the approximate time in this northerly location from the position of the sun is relatively easy - as it is at such a low level in the sky (or altitude), its position can be located by various landscape features (from a fixed location). It does not move much from these features much during the year - in other words its azimuth at the same time each day does not change much throughout the year. As well as the sundial's main purpose of illustrating certain principles of the movement of the sun and moon at this northerly location, it is also designed to tell the time! Reading the dial is easiest if you face the sun (shadow pointing directly towards you) . Make sure you read the time from the correct edge of the shadow - this will be the shadow edge originating from the straight edge of the gnomon, not the polar bear! At times when the suns rays are less powerful and you are having trouble seeing the shadow, it helps if you move your eye level down until you find the shadow. A white piece of paper placed just outside the hour line can also help you find the shadow in these situations. The hours are calibrated into half hours, quarter hours, and three-minute intervals. Correct the reading of the shadow by adding or subtracting the appropriate number of minutes for that particular day of the year. Check the accuracy using your modern time-telling device and be totally amazed! Note: During Summer Time, you will need to add one hour. I made the decision not to incorporate this extra hour as summer time might change or cease to exist during the life of the sundial. As the sundial is more of a curiosity than a time-keeper, it seemed more suitable to have it showing the direction of the sun at true solar times rather than the more artificial summer time. Click here for more information on the Equation of Time. Why build a sundial when we all have digital watches and GPS to tell time with? There are numerous Sundial Societies all over the world with many members who would love to explain this to you! For at least ten centuries, the sundial was the major method of time-keeping. In these days of accurate time-telling devices, sundials are a reminder of the often-forgotten connection between time and the movement of the sun in the sky. Even when the sun isn’t shining on them, they illustrate many concepts of astronomy, particularly of the solar system. There are sundials all over Europe, Australia, and the US, many remaining from the days when they were the main way of telling the time, but many of them just a purely aesthetic and 'old-fashioned' addition to the landscape. Although this sundial was also designed with aesthetics in mind, its main use by far is to incite interest in tourists and locals alike by illustrating certain principles about the movement of sun and moon at these latitudes. 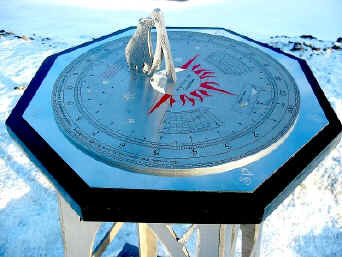 Longyearbyen, despite having a period of Polar Night where the sun doesn’t rise for over three months, is an interesting place to have a sundial because of the unusual behaviour of the sun (covered above in ‘unique features’). The sun is above the horizon constantly for four months around the summer season – this is the time when most visitors come to Svalbard – and will have the opportunity to see the dial working throughout the 'night'. 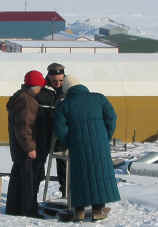 As Longyearbyen is the second most northerly settlement in the world (Ny Ålesund is about 150 km further north), and visited by many tourists, it provides easy access to an instrument which is designed to inspire curiosity in the unique astronomical features of this arctic area. This website is intended to provide more information for people once this curiosity has begun! Similarly, the ‘moon shadow adjustment graph’ has the purpose of increasing awareness of the relationship between the positions of the sun and moon. Children at the local school will also benefit from observations made in conjunction with the sundial. In past centuries, the position of the sun in relationship to landscape features indicated time of day, for example lunchtime and the end of the working day. These days, people often lose sight of the relationship between the sun and time; a sundial helps to re-establish this link. Also importantly, it provides another object for tourists to point their cameras at! Finally, one day when you are feeling stressed with too much to do and too much going on, go and stand by a sundial and watch the shadow move slowly from one minute to the next - feel time slow down and return to its basic foundations. 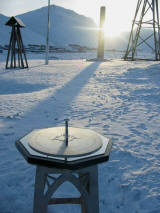 Why build a sundial in Longyearbyen where the sun doesn't rise for over three months? Further, there is actually more light at these latitudes because the sun is never that far from the horizon. Even during Polar Night the sun hovers beneath the horizon, never more than 36 degrees below. Another reason is due to extra refraction of light at these latitudes - we see the sun for around 11 minutes longer before it rises and after it sets. 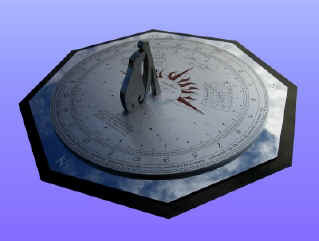 But despite all the above, as mentioned before, one of the main purposes of the sundial is to incite interest in locals and tourists alike by, in its uniqueness, showing astronomical features particular to this latitude. It does its job with this whether the sun shines on it or not! As an added feature of interest (and perhaps a token gesture for the skeptics), I thought it was appropriate to include the Moon Shadow Adjustment Graph so that it can be read by the light of the moon for at least some of the Polar Night. Not surprisingly, most people visit Svalbard during the light period, and many of them walk around town in the ‘midnight’ hours due to the unusual presence of sunlight at this time. The sundial will hopefully add to their experience of this phenomenon. The aim was to make the dial easy to understand and easily comparable to dials at lower latitudes. The horizontal dial being the most common, this was the best for this purpose. The style is simplistic to reflect the nature of a horizontal dial at these latitudes. It is hopefully also appealing to children and will increase their curiosity as to how it works. The majority of the text is in English for the sake of tourists from outside Norway, but Norwegian words which are very similar to English (eg the months of the year and the initials of compass bearings) are left in Norwegian to fit in with the location of the dial. Tony suggested stainless steel for the dial as it tarnishes less than the more traditional brass and bronze. The dial plate is brushed stainless steel so that a shadow can be made on it (reflective surfaces do not create a shadow). The shadow is not as good as on other metals which corrode more, but this was a compromise which had to be made. I wanted a shiny outside rim with the compass bearings on, and Tony said a separate plate underneath the first was necessary - it often reflects the clouds in the sky which can look very beautiful. (see photos page). 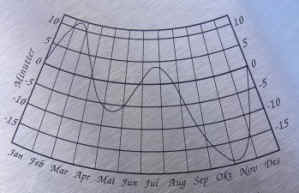 Between the two charts, there is a drawing of the return of the sun on the ‘official’ day of the return of the sun, Soldagen, 8 March (see Sun Events for this and associated dates). The two glaciers near town, Lars and Longyear appear, with the sun returning over the Lars Glacier. I traced the drawing from a photo of the glaciers. See photos page for the actual scene of the suns return in 2004, a day after the installation of the sundial. Instead of a compass rose, the sun is depicted on the southern side of the gnomon, as the sun is present mostly in the southern sky in the Northern Hempisphere. I drew a freehand, less 'static' sun, but when this was transferred to computer it didn't fit in with the more geometric shapes of the rest of the dial plate, so Tony provided lots of sun examples and I modified one of these. The moon and snowflakes appear on the northern, or ‘colder’ side. The plains or ‘seas’ of the moon can be seen on a waxing (increasing) crescent as seen from Svalbard. I traced these from a clear photo of the moon. 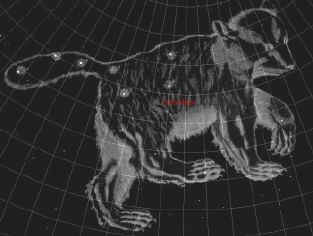 The stars are to scale according to their magnitude and make up the constellation of ‘Ursa Major’ or the Big Bear. This constellation seemed appropriate as the polar bear is one of the main features of Svalbard; it is also represented on the gnomon. The two stars just to the east of the gnomon, Merak and Dubhe in the constellation of Ursa Major, point towards Polaris, or the northern celestial pole, so here they are placed pointing directly north. The glaciers and snowflakes were to be filled with white, but last minute time constraints did not permit this. Each snowflake is individual (as they are in nature). I discovered you can make them by rotating the same design 60 degrees six times, but it still took me hours. Tony, being an expert in Adobe Illustrator (Macintosh), showed me how to finish them in a tenth the time! A motto is one of the standard items on a dial face, so one has been included here. It needed to be specific to this dial, and not one of the often depressing mottos about time going too fast, waiting for no-one etc. It is about the rapid change of light from Polar Night to midnight sun (roughly 20 more minutes of sunshine each day), the restoring time of darkness and the low angle of the sun’s rays up here. Motto writing is not for the faint-hearted! I spent days agonising over this one, knowing it was going to be there for years to come. Originally the etched parts were just to be left a lighter silver colour, like the snowflakes, but when I printed the template out with a grey background it looked quite drab, so decided to have some colour. The colours of the sun and moon are earthier colours, imitating some of the colours of the buildings around. Norwegian house colours are traditionally made from naturally occurring substances and are more subtle than the harsher primary colours. The house colours in Longyearbyen were designed to fit in with both the stark white of winter and the drab brown of summer. Each building has a colour code which must be kept to. The effect is very aesthetic. The only colour on the dial which is more primary is the sun, so it stands out. Gold leaf was considered and might still be applied when the yellow fades. When you see a finished design, you don't see the swarm of ideas that came before it. There are numerous of these, as you can see on the 'photos' page. Peter Rigozzi (furniture designing brother) told me the best way for me to get an idea of proportions and shape was to make a mock-up out of cardboard or plywood. In the end, there were quite a few mock-ups - trying different shapes and sizes, trying to make the smaller ones after the larger ones so the existing ones could just have pieces hacked off them thus limiting the amount of wastage. Both Peter and Tony independently came up with the idea of the stainless steel four-sided base, for ease of transportation and looks. 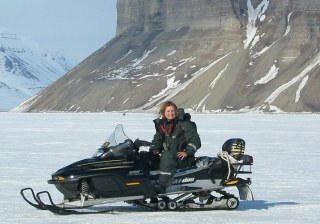 This was after I found out that stone in Svalbard would not be durable enough once exposed to the elements, and the transportation of a stone base from anywhere else would cost a fortune. Initially I made the cross bar lower down (see picture) but there was the worry that children would climb on it, using the gnomon to pull themselves up to look at the dial! I liked the look of this pointed arch, but decided to round it off a fraction as it might have made the dial look like a religious icon! It's amazing what a huge difference a tiny adjustment like that can make. Tony suggested shaping the rail, which looked a lot better. Toying with the idea of having no stone. Mock-up base of plywood - I learnt how to use a jig saw! The granite mounting block was chosen finally after toying with numerous ideas. I wanted coal, or at least the black colour of coal, as a reminder of the sponsor, Store Norske, and also because Longyear, the town, first arose because of the presence of coal. Coal itself would not have been durable enough, so Tony came up with the idea of coal set in resin or artificial granite, but after some research, I found these also might not have proved durable enough. So the decision was made to pay extra and go for real granite, obtained from Nerlands Granitindustri in the middle of Norway. Tony suggested the tapered edge, and when he made a mock-up in Styrofoam with spray paint on, we decided that was the way to go. Initially, we had the ideas to warm the surface of the dial to melt the snow and to have lighting in the dark period, but it seemed too difficult to get power to the spot. There is so much wind in Svalbard that any snow fallen on it is usually blown off fairly quickly, but for the times when it is not, there is a soft brush in a box beside the dial. departure for Longyearbyen early the next morning. Because there could now be no mistakes or second chances this resulted in anxious final hours in the workshop machining the base of the gnomon to fit and final assembly of the dial which was completed just before midnight with his packing for the trip still to be done! Why do it? - because it wasn't there! A sundial at an Austrian Mountain hut, created by some friends for a bit of fun on a long summer day, also inspired interest in the project. 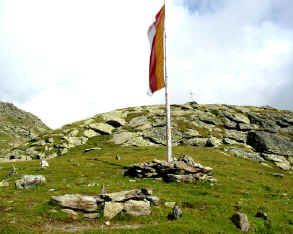 They used the hut flagpole as the gnomon and rocks for the hour markers, but it only tells the correct time for around the week it was created, in mid-August! (because the flagpole is at 90 degrees and not the latitude of the location). I started talking about the physics of sundials to Manfred (a physics student who created the sundial and knew exactly what its shortcomings were!) and started to wonder what one in Longyearbyen might look like. So I came back to stay, from 6 February 2003 to June 2003, to make many observations. The main interest was the huge daily increase in light and sunshine in the transition between Polar Night and perpetual sun. In Tasmania, this difference is about one, at the most two minutes per day. In Longyearbyen the difference is around 20 minutes per day. Also, there was the possibility to take many photos of the wonderful sights up here, especially the sun and sky colours in the different periods. Also intriguing were the extreme weather conditions which, up till then, could only be imagined in my wildest dreams! The weather put on a good show, with plenty of snow, high winds and cold temperatures. The coldest was 30 below with windchill of 49 below. I would go deliberately to experience these extremes - for example on one stormy evening running from one telegraph pole to the next, hugging each one to keep upright in the blasts of wind, waiting for the total whiteouts to clear to find the path again. That night, a huge shipping-type container was blown 30 m through town. I made many observations of when the sun shone on different places at different times and when it rose above certain landscape features and also photographed the midnight sun on many occasions, observing the difference in its altitude the colours in the sky. All these observations meant it was possible to come to some conclusions about the best place to put a sundial. 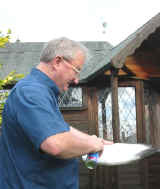 Meanwhile, I had been in contact with Tony Moss, a sundial maker near Newcastle, England who I discovered from his website. It seemed obvious that he was the man for the job! Meeting him when on return to England confirmed the decision - he is totally obsessed with sundials, from early in the morning to late at night and has made numerous projects all over the world. He was absolutely delighted to be given the task of constructing the world's most northerly dial (which he was quick to point out - until then I had no idea it would be). I spent a few weekends with him in Newcastle, traveling from London by bus to discuss the design and make mock-ups. Our working styles are completely different - Tony likes to get ideas fixed as soon as possible whereas I tend to keep working on ideas to the point that things don't get done. There have been a couple of times when we almost strangled each other, but in the end we have still remained friends and the dial has been completed! Tony explained a lot of the theory of sundials to me which was fascinating. He has all the practical know-how as well, having taught engineering for many years. He has a great workshop - unfortunately, to do the actual work on the dial himself, he would have needed a lot more time, as he had many other projects which had to take first priority. But he knows many people in the engineering field and was able to get the actual construction work done by experts in their field. He's also brilliant with Adobe Illustrator and did version after version on the plate on Adobe Illustrator when I kept updating my ideas! He has a good idea of what looks good in reality. Working on the base at Tony's place. Tony pretending to be a gnomon. 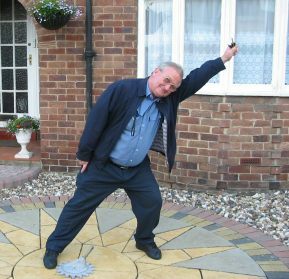 Another dramatic problem was that Tony was almost not here – an infected appendix last November almost made this sundial a memorial to him! So it is great that he was able to finish the sundial and make it up here for the installation and inauguration. A good friend suggested Store Norske as a sponsor. I would like to thank Robert Hermansen for his open-minded attitude to such a project – without him this venture wouldn’t have succeeded. Both Tony Moss and myself have worked unpaid on this project: Tony (a member of the British Sundial Society) for the satisfaction of being asked to create the world’s most northerly sundial in such an unusual location, and myself, for the satisfaction of having a sundial in Longyearbyen (which I decided that it needed a couple of days after arriving!). The overall cost of the dial is about 25.000 NOK. Store Norske, particularly Robert Hermansen, for his open-mindedness to sponsoring such a project, and also for the champagne at the opening ceremony! and last but certainly not least huge thanks to Tony Moss of Lindisfarne Sundials for working on this project unpaid and for coming up at his own expense to install the dial.